If the Greek state was more incompetent than most at protecting its own finances from the ravages of financial speculation (the UK Treasury, for example, has been careful to issue long-dated bonds to try and avert a repayment of debt crisis), the fact remains that every state in Europe, along with the United States and virtually the whole of the ‘advanced capitalist world’ is becoming increasingly mired in debt as a result of the financial bail-outs and now the reduction in revenue from taxation as the recession bites. The state which had supposedly been rolled back for ever has been obliged to wade in and, one way or another, provide some form of ‘quantitative easing’ for a financial setup which would otherwise have collapsed. In the time-honoured capitalist crisis way, states have resorted to issuing government bonds and by so doing have compounded the debt crisis itself which is far from over. Now, not only are the pundits warning of a ‘double dip recession’ the financial markets are getting the jitters about the mounting pile of state or ‘sovereign’ debt. Quite simply, the fear that states themselves may be unable to pay back even the interest on their loans is pushing up the cost of borrowing for governments which, in turn, are obliged to offer higher rates of interest when they try to raise money by issuing bonds. This is what happened to Greece which found that the cost of borrowing on the financial markets had gone beyond its reach [see article Financial Crisis Engulfs the Eurozone in this issue]. Sometimes, as has happened recently with Germany, governments have been unable to raise a loan because there were not enough takers for their bonds. Meanwhile, every state is subject to the vetting of the credit rating agencies which grade companies and governments alike according to the state of their balance sheets as an indication of how likely they are or not to default on loans. Just as with your credit card, the lower the credit rating of a country, the more difficult and expensive it is to borrow. In the EU, apart from Greece, Spain and Ireland have already been downgraded by the likes of Fitch and Standard and Poor’s. 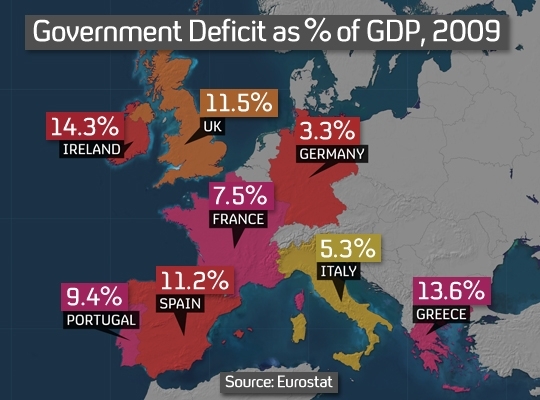 Hence the overriding concern of governments everywhere to reduce the deficit as quickly as possible regardless, or despite, the social consequences for its citizens (or subjects in the case of the UK). Before the general election the biggest worry for UK capital was that a hung parliament would cause ‘uncertainty’ – i.e. delay – in imposing measures to cut a deficit which currently stands at approximately 8 per cent of GDP. Why the hurry? Why not wait, in Keynesian fashion, for the economic upturn? The answer is that the Treasury and Bank of England are running to the call of the financial ratings agencies and the fear that UK capital might lose its ‘triple A’ credit rating which would also have the knock-on effect of undermining confidence in sterling. (The flimsiness of any upturn is another matter.) Predictably, therefore, the markets were reassured by the easy way UK politicians organised a cosy coalition government ready to get down to the onerous task of ‘reducing the deficit’. On 12 May the Financial Times cheerfully recorded the markets’ reaction with the headline ‘Sterling and Gilts Soar’. So, having reassured the markets for now, the task only remains for the politicians to determine where the axe is going to fall. So far Osborne’s announcement of an ‘immediate’ £6.2bn cut in government spending is going to mean between 30,000-50,000 jobs lost, much of this simply by not rehiring short-term contract workers. But this is no ‘ordinary’ downturn. Sure enough Iain Duncan Smith, Work and Pensions Secretary, has already promised to press ahead in the autumn with a review of the work capability of all people claiming any sort of invalidity benefit. This, combined with promises to apply sanctions on claimants who refuse ‘job opportunities’ is a clear message of what is immediately in the offing. However, even if Duncan Smith himself is not sure where his review is going to take him, it is clear that the whole principle and framework of a universal benefits system that has gradually been eroded over the years is due to be replaced by what he describes as a single withdrawal rate for all benefits. Above all, the government wants to ensure that it is no longer ‘worthwhile’ for anyone to claim benefits rather than accept the lowest paid work. Inch by inch the principle of ‘less eligibility’ which underpinned the New Poor Law of the nineteenth century (i.e. the principle that workhouse conditions should be made less preferable than those of the lowest paid labourer) is replacing the principle of universal welfare. As it is the full annual basic state pension stands today at £5,078, an impossible sum on its own to live on. The announcement that after 2016 for men and 2010 for women the state pension age will be sixty-six is an irrelevance for most people who will have to work longer in any case in the increasingly vain hope of building themselves a pension pot large enough to live on. Of course this does not stop capitalists from seeking new ways of making a profit –when push comes to shove it does not matter to them whether this means transferring production to areas with rock bottom wages. And when it is more profitable, in money terms, (because capitalists themselves do not distinguish between value expropriated from wage workers and nominal financial values based on bits of paper) to simply ‘invest’ in the financial markets than to employ workers in productive labour financial speculation comes to the fore as it has done with a vengeance today. Yet the more capital is directed to financial speculation which does not generate new value but which, on the contrary, creates a massive virtual world of parasitic fictitious capital representing nothing at all except the overblown value of an initial real asset (such as a house), the more the system as a whole is weighed down by its burden of debt. This is a situation which is wholly due to capitalism. It is not the responsibility of the working class. Yet, it is workers who are paying and - so long as this system exists - are expected to paythe price. Perhaps, though, the capitalists themselves are sensing danger ahead. This particular stage of the crisis is by no means over. (The capitalist world as a whole still has $30,000bn of outstanding credit default swaps waiting to implode; in the UK the pundits are worried about the £50bn of commercial property loans which are in trouble, 70 per cent of them due to mature in the next five years.) However, there are only so many attacks that can be made without provoking widespread anger and resistance; without the myth that ‘we are all in this together’ breaking down. Already capital is sensing the need to call on the unions to control the working class, to divide and limit any resistance. For instance, the Court of Appeal’s overturning of the previous injunction against the BA strike has reversed a five year trend of bosses calling on the courts to stop a strike (43 cases, 90 per cent of them won by the bosses). At the same time there are growing calls to limit the astronomical personal incomes as well as the speculative activities of the financial sector (as if this would make the cuts more bearable). It is shaming when hedge fund managers pay a lower rate of tax than the people who clean their offices. A year ago, as political leaders sought intellectual support for stimulus spending, John Maynard Keynes, the great economist, returned to fashion. It may now be time to brush off those dusty copies of Karl Marx as well. The bail-out of the financial system and the need to appease bond markets are largely problems of capital. Labour, meanwhile, bears the brunt of unemployment, depressed wages and, eventually, higher taxes. As the reaction of workers in Greece to that country’s ferocious austerity measures has shown, attempts to deal with public debt loads can cause tempers to fray. There could hardly be a more striking illustration of how class conscious these spokesmen for capital are. Apart from putting down workers’ legitimate anger at the threat to their livelihoods as a bout of bad temper, this shows that the advisers and opinion shapers of the ruling class are well aware that the class struggle is by no means a thing of the past. They know that a certain amount of resistance is inevitable. However, in the spirit of the one- nation Tory, they want to believe that there is a national interest that everyone shares above class interests; that capitalism, if managed properly, can provide prosperity for all. The split between capital and labour may well be a false distinction. Imploding banks are bad for everyone and businesses need funding to expand and hire. … Bans on short selling and measures to curb speculative trading already suggest a mood of anger at unfair profiteering. There are legitimate arguments both for and against taxing capital at a higher rate, largely revolving around what encourages entrepreneurship. Taxes have to rise, though, and capital has a fight on its hands. In other words, the mainstream spokesmen of capital are - albeit reluctantly - joining in the calls of the capitalist left to tax the rich and clampdown on financial capital. It is part of the growing argument that there are good capitalists and bad capitalists, the good ones being the ‘entrepreneurs’ who create real value. This not only ducks the question of why financial speculation has taken over in the first place, calling for laws against speculators could be a dangerous diversion for any incipient resistance movement by the working class. This will not be the only pitfall workers face in the months and years ahead. One thing is certain, though, to paraphrase the words of David Cameron, workers’ living standards and whole way of life are under attack as never before. The battles which lie ahead will not be worth fighting if they do not lead to the creation and strengthening of a strong political vanguard which illuminates the way forward for workers, not just here in Britain but throughout the world. The first step on that road will be for workers to recognise once again that their own interests cannot be reconciled with those of capital. (1) Statement by the Internationalist Communist Tendency issued May 2010, available on our website. (2) 25.5.10 ‘30,000 Job Losses Seen As Tip of Iceberg’. (3) ‘Time to Turn the Spectre into Reality’, Revolutionary Perspectives 49. (4) Editorial, 5-6 June this year. In fact the piece went on to recommend investors to sink their money in Brazil.